Britons have been heading to the polls for European, local, London mayoral and assembly elections. 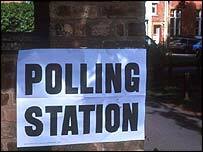 Polling stations will remain open until 2200 BST, in what is likely to be the last test of public opinion before a general election. The first local election results are expected at 2300 BST, with London mayor and assembly results not expected until early evening on Friday 11 June. UK results in the European elections are set to be published on 13 June. Tory leader Michael Howard and his wife Sandra headed out to their local polling station in Lympne, Kent, to cast votes on Thursday. Tony Blair posted his vote in from London before heading to Savannah, Georgia in the US, for the G8 Summit of world leaders. Meanwhile, Liberal Democrat leader Charles Kennedy and wife Sarah visited a South London polling station to cast their votes. Elections are taking place in 166 local English and Welsh councils, as well as for London's mayor and assembly. All UK voters are also choosing their members of the European Parliament. Millions of people across Northern England and the East Midlands have already cast their votes in the biggest all-postal ballot ever attempted in the UK. As a result, European election turnout is already higher in many areas than in 1999. But there were fears that many voters will not have received their ballot papers in time, with some councils having to resort to delivering them by hand. Two emergency polling stations have had to be set up by the council in Bolton after thousands of voting packs went undelivered. The final days of campaigning were marred in some areas by accusations of fraud and voter intimidation, which are being investigated by the police and the Electoral Commission. All-postal ballots are being piloted in the North East, North West, East Midlands and Yorkshire and Humber regions.